This 14-story apartment building was erected in 1930, the same year as the adjoining 38-story former Barbizon Plaza Hotel that is now a condominium building known as Trump Parc (see The City Review article). 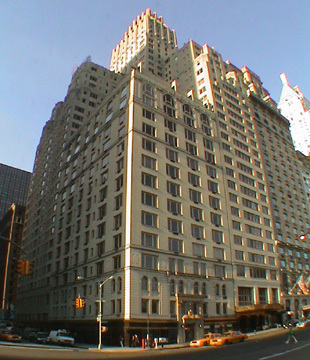 Donald Trump converted the taller building in 1988 but encountered stiff tenant resistance to his conversion at this building and its conversion to a condominium was not completed until 1997. The two buildings are similar in architectural style although this one does not have the fabulous and very flamboyant top of its taller neighbor, which wraps around this one and extends to 58th Street and the northeast corner at the avenue. Trump unified the retail frontages of both buildings along the Avenue of the Americas and their window treatments are similar. The visual effect is that they read as one building, but they have separate entrances along Central Park South. Whereas the entrance of Trump Parc is spacious and landscaped and polished, the entrance of this building is more modest in size although it is quite elegant. This building has 81 units, a step-up lobby, a concierge and a handsome lobby. It has arched windows on the third and top floors and no sidewalk landscaping and no garage. In describing the emergence of a luxury hotel district around the southeast corner of Central Park in their excellent book, "New York 1930, Architecture and Urbanism Between The World Wars" (Rizzoli, 1987), Robert A. M. Stern, Gregory Gilmartin and Thomas Mellins wrote that while "the Central Park South hotels were less resolved architecturally and more troubled economically," "the best of the group was the Barbizon Plaza designed in a Modern Classical vocabulary by Lawrence Emmons, architect and decorator working with Lloyd Morgan and Murgatroyd & Ogden, as general architects." "The building rose from a bulky street-defining mass to a comparatively slender tower crowned by a hipped roof covered with small glass tiles set on their edges in narrow ribs of reinforced concrete. By day the tiles shimmered in the sunlight;' at night, the Barbizon Plaza's all-glass pinnacle transformed the tower into a prism of light. According to the Architect tests proved that a `mellow phosphorescent glow duplicating the texture of moonlight' could be achieved by the lighting system, which consisted of a `series of flood lights placed inside the glass walls of the tower playing their rays inward to an arrangement of seried windows,'" they continued. Their book includes two photographs of the Barbizon Plaza with the described roof and they indicate that it curved in from its side pillars and culminated in a flat, albeit colorful and light-emanating roof. That roof no longer exists. At some point, the roof was redesigned, probably during World War II when the city discouraged night illumination of buildings. The present design, which most likely never would have been approved by city's landmarks agency if it had jurisdiction and had designated the building as a landmark, is one of the most spectacular in the city, indeed its only rivals in audacity are the Chrysler Building and the former RCA/GE tower at 570 Lexington Avenue. The side top pillars of the building have been extended upwards to create an uneven, but very impressive, row of teeth around the top and the entire top has been gilded. In an age of satellite dishes, rooftop protuberances are not rare, but this roof is not some haphazard, Deconstructivist relic, but an extremely powerful form. The exposed top pillars propel the building skyward. The new design is much better than the original, sort-of-shallow-domed roof, although it might be nice if it could once again be light-show enabled. The top of the tower, furthermore, bulges. Its pillars extend outwards much like those on the Helmsley Building straddling Park Avenue at 46th Street and reminiscent of the bulging top of the Singer Building on Lower Broadway, which was one of the city's most important skyscraper landmarks that was lamentably demolished. This building's identity is hard to separate from that of the taller tower and together they are an impressive ensemble that add considerable dignity to Central Park South. There is heavy traffic at this corner as it is the northbound entrance from midtown to the Central Park Drive. It is convenient to public transportation, shopping and restaurants and directly across from Central Park and therefore has spectacular views.